In Southeast Asia, there live big apes called Orangutan in the Malay language, or the "Jungle Man." Orangutan is one species of mammal that has a human-like behavior. Native to Indonesia and Malaysia, they are only found on Kalimantan Island and the far northern parts of Sumatra Island. 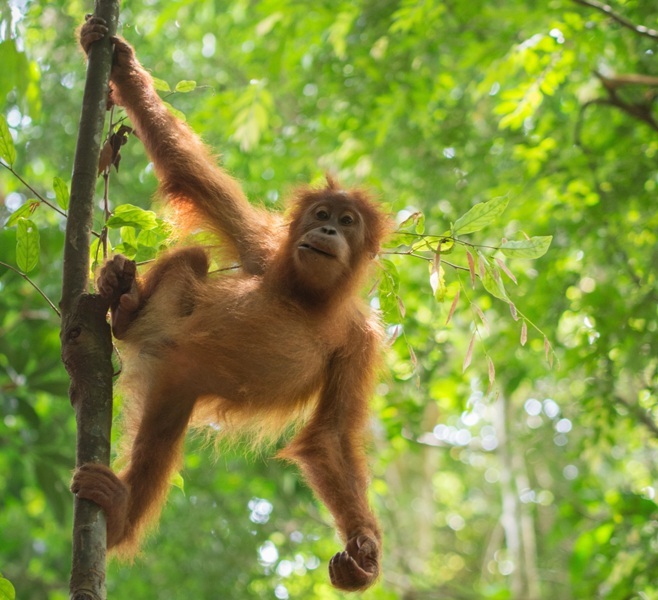 Orangutans' time is mostly spent in trees. They travel from tree to tree through branches using their long limbs. They seldom roam on the ground, but sometimes they crawl. As they find it hard going through treetops, each day they only make climbs of a few hundreds of meter. On the top of trees, they build a nest. Older males are often found traveling and sleeping on the ground. Male orangutans can reach a little below 1 m tall and weigh around 77 kg. The females are smaller, only around three-quarter of a meter tall and half the weight of male. Both male and female orangutans have coarse, long, reddish-brown fur. Appearance-wise, the males are different, in that their cheeks are puffy and that they have a kind of pouch hanging from their throat, which contains air shacks make them heard from a distance, as they help orangutans make loud groans. Orangutans mostly eat fruit, young leaves, inner bark, and eggs. In the winter, they collect fat to anticipate the monsoon season which lasts from April through October, when food is much less available. Orangutans like living alone. They travel and find food on their own and gather only for mating. Female orangutans look for adult males when they are ready to mate. Each pair will stay together until the female is pregnant. One baby is born to a female orangutan every four or eight years. Until they stop breastfeeding at about three to five years, they learn to be more independent on their mothers. In the next three to five years, they learn to be more independent. They become completely independent by the age of eight. Sometimes orangutan mothers pair up for a few days. During that time, their infants become playmates. People hunt orangutans continuously, although there is a policy against killing, owning, or exporting them. Their natural habitat is fast disappearing, due to illegal logging and forest burning. In the 90s, in Sumatra and Kalimantan, thousands of orangutans were killed and the habitat of thousands more was destroyed in major forest fires. Those fires and killings were a threat to the existence of orangutans. 0 Response to "Orangutans - Species Whose Habitats are Endangered"